In a previous Blog I discussed the change to the Building Codes that requires manufactured wood floor framing to be covered with a 30 minute radiant barrier because they will burn quicker in a fire. This means covering up those unfinished basement ceilings as a safety precaution. And as I stated earlier, I strongly recommend that builders be aware of the codes and requirements around this. However, there are new ways to protect exposed TJI floor framing for fire reasons. Instead of installing an entire ceiling, you can also install boards along the exposed sides of the web. I have seen this done and while I haven’t done the calculations, this would probably use less material and be more cost efficient than installing the entire ceiling. I have been following this topic and I urge you to research and make sure you are aware of the options available. If anyone has found other solutions, please let me know so we can share them with others. Your best source would be IRC section R501.3 Fire protection of floors. Because building codes are established by each State it is best to check there. According to IRC section R501.3 Fire protection of floors, it would be for all floor framing not consisting of dimensional framing lumber 2×10 or larger. Hello, I am woundering if you have a page that is based on the topic of building code changes? 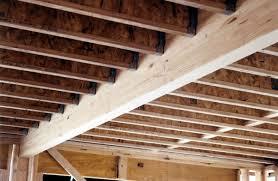 Is it only for a TJI flooring system or a floor system consisting of I joists in general?